Description: It seems astonishing that in the 21st century decisions on health care can still be made without a solid grounding in research evidence. This is true even in clinical research, whether for simple or complex interventions, where systematic reviews time and time again conclude that the evidence base is inadequate. 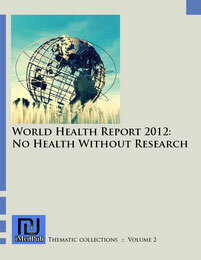 It is even more true in the areas of health policy and health systems, where quality research is hampered further by a lack of shared definitions, a lack of consensus on guiding principles, poor capacity (especially in low-resource regions), and methodological challenges.The WHR 2012 aims to provide impetus for a change to the problematic state of affairs of health research. Given the stated goals of the report, of particular importance is the documentation and sharing of real experiences from the countries where the research has been done.